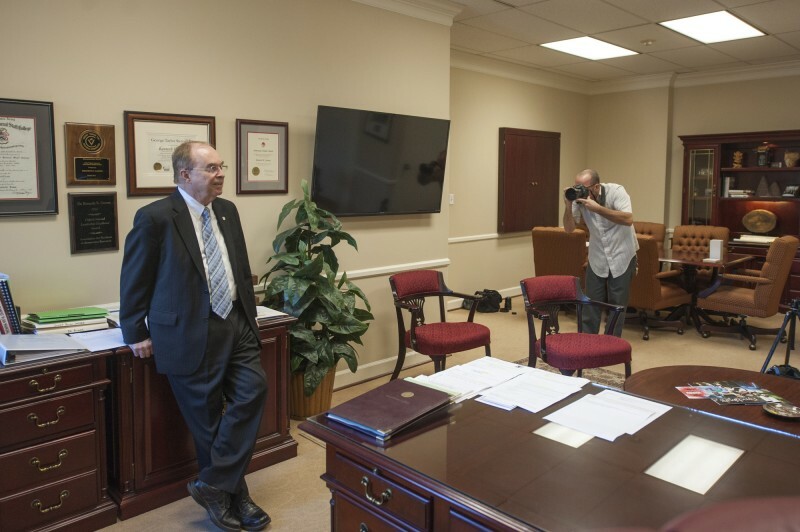 University of Lynchburg President Dr. Kenneth Garren poses for a Wall Street Journal photographer in his office. A recent story in the Wall Street Journal demonstrates the role that University of Lynchburg President Dr. Kenneth R. Garren has played as a leading voice in higher education. Published Monday, “Colleges Flex Lobbying Muscle” by Brody Mullins explains how college presidents worked against a proposed federal college rating system that would have made a student’s federal financial aid depend partly on a score the student’s college received from the government. Dr. Garren was at the forefront of an effort to educate Virginia’s congressional delegation about the negative impact the plan would have on opportunities for students. This summer the U.S. Department of Education altered its plans for the rating system and chose to publish more comprehensive data about colleges and allow students to decide how to judge a college. The Wall Street Journal article can be read in this PDF or on the Wall Street Journal website.